The holiday season is upon us and so is the time for feasting. And, along with some delightful recipes, we have something better to share. This time, you can feast guilt-free with the potency of organic flavours and goodness of health. In a pan heat 60ml oil and 150g honey till the honey liquidizes. In a bowl, mix this syrup along with 250g rolled oats, 150g sunflower seeds, and 100g bran. Spread this mixture in a baking tray and roast them for 20-25 minutes in a preheated oven (180 C). Turn the sides at least 4 times for the mixture to roast evenly. Coarsely chop 150g dates, 100g dried apricots, and 100g hazelnuts after roasting the hazelnuts for 10 minutes. Now, mix everything together, along with 100g wheatgerm 100g sultanas. With the natural sweetness of honey and heart-friendly energy packed nuts, a tasty snack is only a bowl away. Looking for a gluten-free noodle recipe? Then all you need is zucchinis, carrots, yellow squash, and beetroots. With the help of a julienne peeler, just keep scraping the vegetable lengthwise and voila your noodles or vegetable noodles are ready! Just boil them like normal noodles and stir fry them for 2 minutes in oil, adding salt, pepper, and the sauces of your choice. For a rich, cheese-like taste mix in a generous amount of grated almonds! Noodles will not only give your meals a unique diversity but also help you incorporate ample veggies in your diet. Chicken is a great source of proteins but can a chicken dish also include the goodness of a fruit, honey, and a vegetable? Why not? De-seed 1 medium acorn squash (or butternut squash or pumpkin) and chop it into ¾ inch thick slices. Mix half teaspoon of kosher salt, 1 Tbsp oil and a pinch of red chili powder with the slices. Spread on a baking tray and roast them for 20-25 minutes in a preheated oven (220 C). In a pan, at a medium flame, heat some oil. Fry 4 chicken breasts (after rubbing quarter Tsp of pepper and half Tsp of kosher salt into them). Cook the breasts for 6 to 8 minute (each side) or till golden brown. Remove the chicken and in the same pan cook 1/3rd cup pomegranate juice for a minute. Add 1 Tbsp balsamic vinegar and 1/4th cup honey. Cook till it thickens. Glaze the chicken with the paste. Sprinkle squash with 1/3 cup each crumbled feta or cottage cheese and pomegranate seeds and finely chopped mint (1 bunch). This Christmas, keep it simple, tasty and nutritious with 24 Mantra Organic . 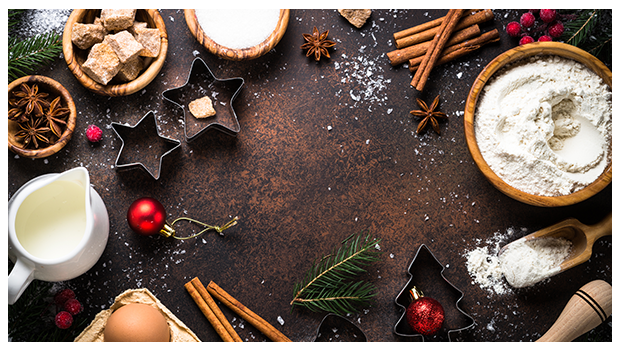 We wish you a delicious Christmas and a healthy New Year!